What an exceptional night. If there is one thing I love more than eating, it’s talking with chefs that are making these amazing dishes. Tonight was all about that. 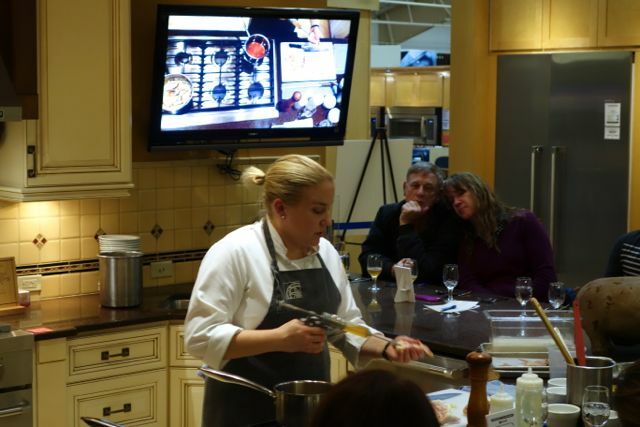 We were able to talk with Chef Sarah Schafer from Irving Street Kitchen as she showed us how to make crab bisque and fried chicken. 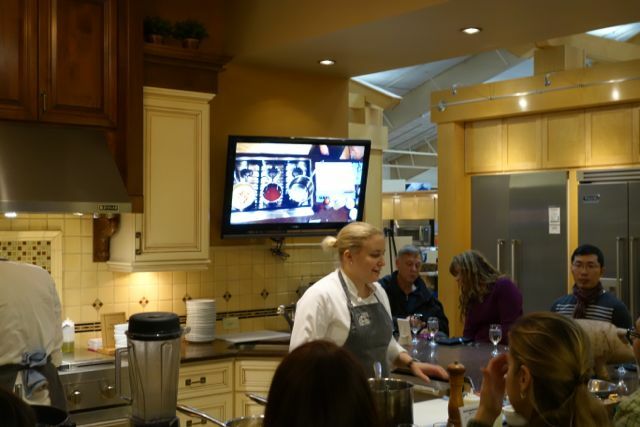 These demos take place in Beaverton at Standard TV & Appliance. They open up one of the kitchens and the chef takes over. It’s a small group and it offers such a personal time with the chef. The group asked all kinds of questions from “Explain more about what you are doing” to “How did you get started?” Chef Sarah was so kind, so sweet and very personal. She loved being there and you could tell she was passionate about what she did and sharing it with us was a bonus for her. I love that Portland Food Adventures has created this kind of setting for all of us to enjoy. It seems like the only the big time food writers (ie. Portland Monthly) get to actually sit down and talk with chefs. The rest of us just wish we could. Well, with Portland Food Adventures you now can have the opportunity to do just that. 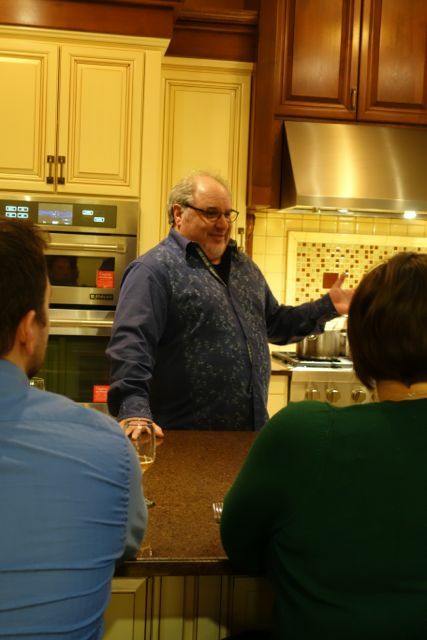 This one I attended was called “In the Kitchen”, which came with a cooking demo followed by a 3 course meal with beer pairings. Chris Angelus, who founded Portland Food Adventures, always gives an intro and talks about how the night will look. From there, the chef takes over and starts to share with us how to create great meals. The focus of the night was how to make buttermilk fried chicken. Chef Sarah showing us how she makes her chicken extra moist. Her secret was this added brine and a buttermilk bath for about 10 hours. She even took the time to show us how to cut up a whole chicken, which I always seem to do wrong, but I think I might have it down now. After all her tips, tricks we were presented with this gem. I should back up and let you know that we started with a great Delicata Squash and Dungeness Crab Bisque that was creamy and rich and amazing. 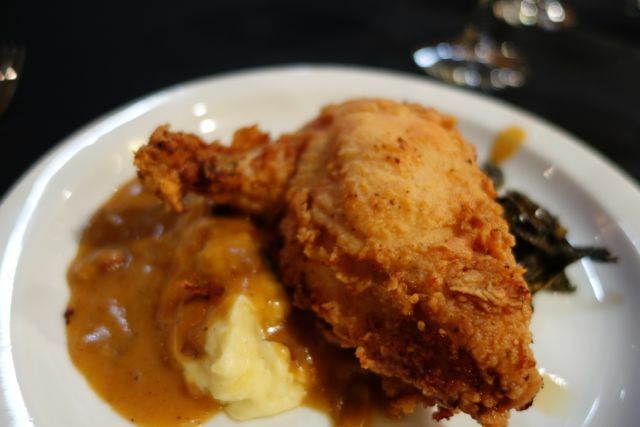 It’s just that the most awaited menu item of the evening was the fried chicken. It is the best fried chicken I have had. I was given a breast, even though I was hoping for a thigh, and it was as tender and juicy as any dark meat. The flavor was outstanding. The collard greens? She nailed them. I usually scoot them aside, but not with these, cooked perfectly. She did not teach us how to make these, but when someone asked she told us how. I loved all that we learned. 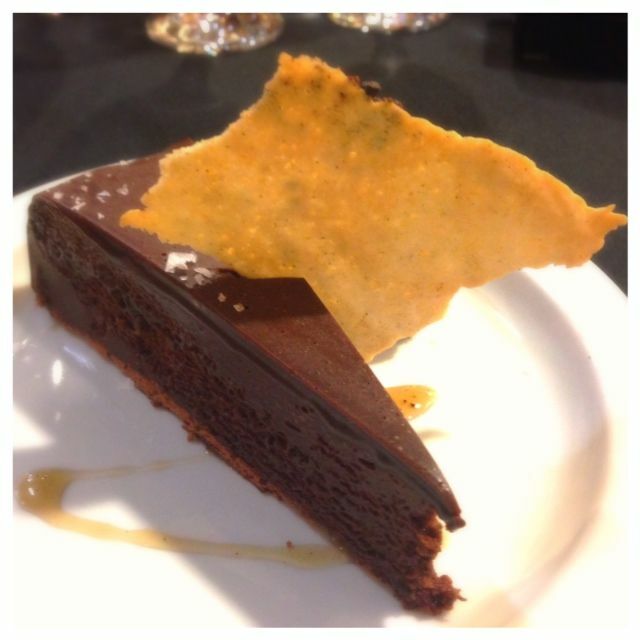 We ended with a flourless chocolate cake. I am not a huge fan of chocolate, but this cake was divine. I ate the whole thing and loved every bite. I later found out from chatting with her that she is also a very accomplished baker, not that we hadn’t already discovered that. There are other Portland Food Adventures that have 6 course meals and with drink pairings. Everything is included with the price and you walk away with gift certificates to the chefs favorite restaurants. Often times you will have about $40 in gift certificates. I have attended both experiences and I honestly can’t say which one I like better. The 6 course meal is where the chef wow’s you with things that might not be on the menu plus the interaction with all the other guests is part of that experience. The IN THE KITCHEN is less formal and more learning. There is less of an opportunity to talk with your neighbors because you are learning about something. 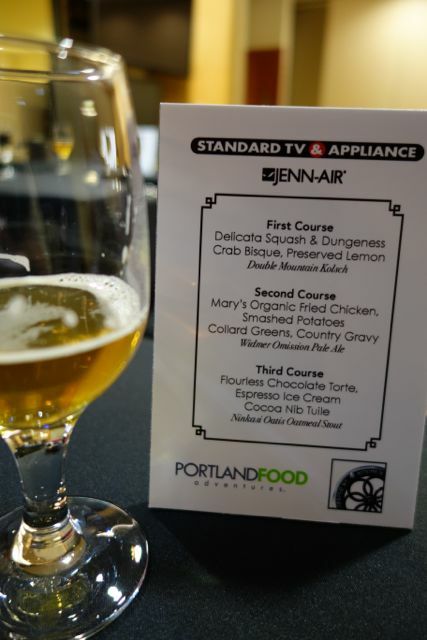 You need to check out Portland Food Adventures and see what events are coming. If you buy the Portland Food Adventure and IN THE KITCHEN with the same chef you can get a discount on the price. You can also purchase each separately. This is a dining experience you need to try at least once. I won’t lie, once you try it, you are kind of hooked on them. If you are interested in any of the food we dined on be sure to check out Irving St. Kitchen. I know I have added them to my breakfast list for sure. You’re not a fan of chocolate!? I will never understand that! I usually order whatever dessert on the menu has chocolate in it.